The Downtown Campus of Buncombe Street UMC is located in the heart of Greenville, SC. Our Sanctuary faces Buncombe Street, but the Downtown Campus occupies the entire block formed by Academy, Buncombe, Richardson, and College Street. 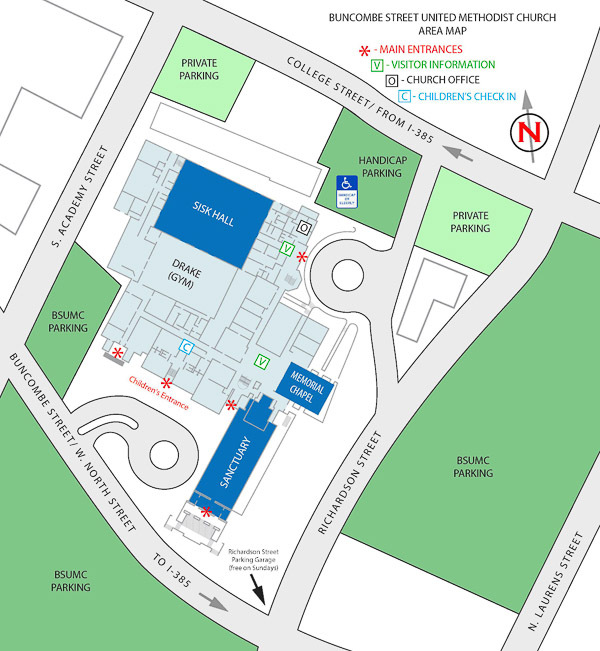 Parking is available in various lots around the church property. On Sunday, all of the dark green lots on the map are available for church parking. However, please note that on Sunday mornings, the College Street parking lot is reserved for handicapped and senior adult church members. Although our parking lots are all owned by Buncombe Street United Methodist Church, the large lots across Richardson and Buncombe Streets are leased to other persons Monday through Friday from 8:00 AM until 6:00 PM. Please do not park here during the business hours of the work week. These parking lots are available for church activities during the weekday evenings or on the weekends for members displaying a BSUMC decal. Decals are available at the Welcome Center or in the church office. The lots on College Street and off Academy Street near the entrance to Drake Hall are available for church members to park in 24 hours a day and 7 days a week while displaying a BSUMC decal. During the week, the College Street lot is the preferred parking area for those coming to the church office, for Crisis Ministry clients, or for those attending activities in Sisk or Drake Halls. God has entrusted time, talent and treasure to each of us. Let us respond to His blessings by giving our time and talent in service to His Church.